This classic, timeless frosted 11 oz. tumbler is decorated with your logo, then hand poured with scented soy-blend wax. Each candle contains clean-burning, eco-friendly cotton wick, which creates a beautiful muted glow. Every imprint color is gorgeous on these matte frosted candles. Our favorite fragrances for frosted candles are: Green Tea, Lavender and French Vanilla. 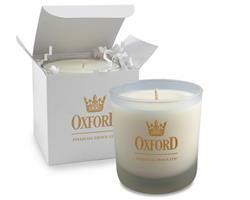 Each candle is packed in a 1-piece, tuck top white gift box, imprinted with your logo. Makes a great and elegant holiday gift we love this custom candle. 1 color Screen print or 4CP label. Run Charge of $0.44 run charge per color per piece for each additional imprint color.